My former colleague Jenny launched a blog this week called Mama Needs a Big Idea. Jenny is a writer by trade and has come up with some fantastic work for McKinney, so it’s no surprise that her blog is great. Jenny is trying to balance the crazy world of advertising with an upcoming new project: she’s going to be a mom to a baby girl. Like most of us on the brink of having our lives turned upside down, she’s freaking out a little. My favorite post of hers so far was about trying to squeeze her pregnancy-altered body into her “client boots” for a big meeting. Her story brought back a memory I must have been trying to suppress: I was eight months pregnant with Noah, and we had clients coming to town from Denver for an all-day meeting. In addition to preparing for the meeting, I was stressing about what to wear. It was winter, and my feet and ankles were so swollen, I couldn’t get them into any of my dress shoes. On an average day, I could wear my yoga pants to the office. But clients were coming. I made an emergency late-night run to DSW, where I found my holy grail: a pair of black pleather flat-heeled knee-high boots, a half-size bigger than I normally wore and specially designed for a “wide calf.” They might has well been marked “Maternity.” And they were 40% off. Done. I wore the maternity boots with maternity tights and a maternity wrap dress and sweater. I thought I looked pretty good, big belly and all. The clients arrived, we exchanged pleasantries and all settled down in the conference room. Now, when it comes to conference room temperatures, there is no such thing as “just right.” They are always either too hot or too cold. You can guess which one it was for the pregnant lady in the sweater and synthetic boots. First, the underside of my belly began sweating where it rested on my upper thighs. Then, as if fighting against the suffocation brought on by nylon and pleather, my calves, ankles and feet began to expand. It was so agonizing, I had to keep taking breaks to hide in a bathroom stall and take off the boots to relieve the pressure. Fortunately, everyone expected me to be in the bathroom every 20 minutes anyway. I still have those boots. It turns out that after Baby #2, half-size up became my permanent size. They’re no longer my “client boots,” though. Or even my “casual playdate” boots. They’ve been relegated to “Southern snow boot.” They got a lot of use this year. Anyway, Jenny’s latest post was a reflection on all those things moms want to/think they should do before the baby comes. I was going to leave her a comment, but realized I had a lot to say. So, based on my personal experience, here’s my list. 1) Go to the movies. I know, I know. When the baby comes, you’re going to spend plenty of evenings at home. And with Netflix, Amazon, cable on-demand and Redbox, you’ll have an endless supply of movies to watch from the comfort of your own couch (and in the comfort of the stained pajama pants and nursing bra you’ve been wearing for three days straight). But if you have any love whatsoever for the experience of watching a movie in a theater, do it now. Sure, once baby is on a fairly consistent schedule and you feel confident leaving her with a babysitter and a bottle (and twelve different ways you can be reached in case of an emergency), you can choose to go to the movies. But suddenly you will find that the movie times aren’t terribly conducive to your schedule. 7:00 is great if you can leave the house before baby’s bedtime. 9:30 guarantees you’ll fall asleep before the credits roll. Any movie longer than 92 minutes is out of the question; it’s too much of a time commitment. And once you factor in tickets and popcorn and that box of Raisinets (what would be the point of going to the movies without Raisinets?) you might as well have just gone out to dinner and spent two hours having a conversation in which one of you isn’t yelling “What? !” over the screams of a newborn. 2) Stay up late and sleep in. If you’re near the end of pregnancy, you’re probably tired at the end of the day. But that doesn’t necessarily mean your bed is your friend. Your hips ache from sleeping on your side; rolling over to the other side is an Olympic sport. You’re getting up to pee every three hours. You have heartburn. The baby has hiccups. Lounging in bed is not the lovely thing it once was. Do it anyway. First, stay up later than you should. Just because you can. I can’t count how many Saturday nights Pat and I get home at 11:00 from a night out and say, “Wouldn’t it be awesome to sit on the porch and have one more beer?” But instead we go to bed, because little people will be coming for us in the morning, and early. And if we have another beer, they might as well be coming with tiny pitchforks and torches. We fondly reminisce about those crazy pre-kid Friday nights where we’d watch an X-Files marathon until 3 a.m. because there was nothing stopping us from sleeping until noon. You know what I miss the most? Lying in bed with a book that is so compelling I cannot put it down until my eyes are burning and I’m practically falling asleep. Then, and this is the kicker: sleeping until I wake up of my own accord, rolling over, picking the book up off the floor and continuing just where I left off. Not going downstairs for breakfast until I’ve finished the book. Oh my God, what I wouldn’t give for just one of those days. 3) Read the entire Sunday paper over a lazy brunch. I may be in the minority, but I still get the newspaper delivered every day. And there’s nothing better than the Sunday paper. In my early 20s, I’d spend an entire hungover Sunday afternoon with the Chicago Tribune. As far as brunch goes, it doesn’t matter if you go out or stay home. The key is that you get something yummy to eat and a cup of coffee or tea (decaf is fine) and just sit there. Read the entire paper. Let no one distract you. Not a newspaper junkie? Just have a lazy brunch. With friends. Same effect. Sure, you’ll still shop after the baby is born. Beginning with maternity leave, shopping is an easy way to get out into the land of the living. When the baby is little, you can just plop him in the carseat and go right from house to car to stroller to store and back home. He may even fall asleep along the way. If you’re getting toward the end of your pregnancy, I understand that you can’t go on a plane or venture too far from your birthing place of choice. Just go, without calculating when you’ll have to stop to nurse or when you’ll have to be home for nap time. Go, without a bag full of diapers and wipes and Goldfish crackers and pacifiers and lovies. Go, without a stroller in the trunk, or without realizing 20 minutes into your drive that you forgot to put the stroller in the trunk. Go, without having to spend the entire ride straining toward the back seat to reinsert a pacifier or deliver those Goldfish crackers or reach that lovie that’s now somehow under your seat. Go, without having to ignore the cries of your bladder past multiple rest stops because the baby finally fell asleep and you would rather risk uremic poisoning than wake that child up by stopping. Go, without having to go into that rest stop and witness your child grab the toilet seat with both hands, then lay on the floor next to the toilet, and inevitably get his hands in his mouth before you’re able to wash them. Near or far, new or familiar, it doesn’t matter. You have thoughts on this, I know you do. 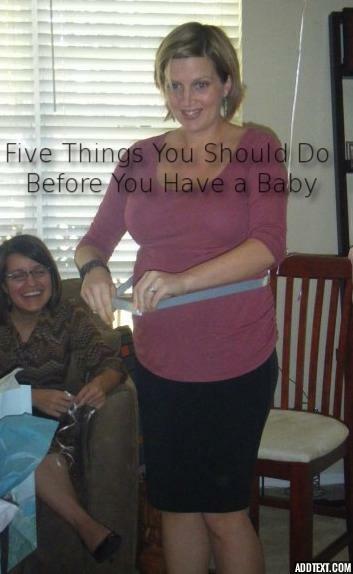 What advice would you give a mom-to-be for her last couple months without children? Enjoy a pre-baby proofed home. Nothing makes you appreciate being able to move freely about your home like walking over baby gates 1,000 times a day or not being able to open drawers and doors at first pull. That and scanning any room you enter (kid or no kid, it becomes automatic after awhile) to make sure nothing can be pulled off of a shelf or run into or fall off of. ← Clean Eating Challenge: Day 5 – Almost There!